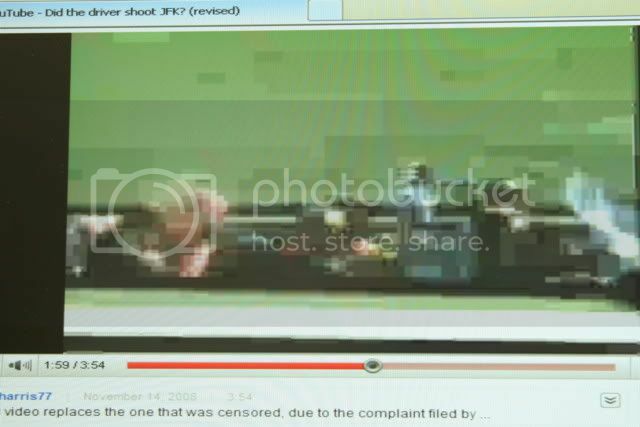 I knew a long time ago, bobharris77 had realized during the making of this clip that the film had in fact been altered to hide the fact the driver shot Kennedy. He did make some adjustments to it because you can no longer advance it with your mouse from 158-200-202. At two minutes you could see the red smoke and then advance to 202 and see the red blotch appear, both of those happening in unison with the white extending backward. At around 1:30 he's babbling on about how the driver's left hand is at his side while holding steady at frame 312. At the end of his verbal nonsense he advances to frame 313 where you can clearly see it extend in sync with the headshot. What he did was create this effect which distracts the viewer from seeing the fake white working in sync with the fake red blotch. He did this because the screen didn't change for 30 or more seconds before advancing it to 313. This amount of time would have revealed to at least some viewers the connection between the fake reflection and the headshot. Bob, knows the driver fired on Kennedy and this effect proves it beyond any doubt. Bob, is a wannabe conspiracy theorist which means the driver did it, is off limits. This should teach anybody out there...do not try to use the film to disprove an obvious fact because some sleuth may come along and use it against you. After this idiot found out I was using his stupid video to prove the film was altered he went back and enhanced the effect to better hide the fake white and fake mist causing and hiding the headshot from the front. The above effect was created to hide the fake reflection and fake blood mist from working in sync to cause and hide the heashot coming from the driver. Watch the fake white extend in unison with the red mist between 312-313.